A Sandtrooper Sergeant from the epic space opera franchise Star Wars. The Sandstrooper Sergeant enforces the law of the Galactic Empire in all desert areas ! Kotobukiya presents the Sandtrooper ARTFX+ snap-together figure kit, as chosen by the fan poll at Star Wars Celebration VI. A Sandtrooper was an Imperial Stormtrooper equipped with a modified armor and equipment to withstand the harsh climates of desert planets like Tatooine. The Sandtrooper Sergeant features an all-new sculpt with subtle differences from the previously release Stormtrooper 2 packs, as well as new weapons and equipment. . Features magnets embedded in the feet for extra stability on the included base. 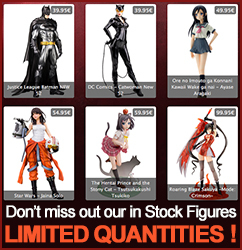 Display alone or along with other ARTFX+ 1/10th scale Star Wars statues from Kotobukiya ! © 2013 Lucasfilm Ltd. & TM. All rights reserved.